If you’re looking to score that $69.99 Galaxy S Blaze 4G deal going on at Costco right now, we’ve got one more reason to entice you to head on down to your local store right away. We’ve gotten word a few days late (and complicated by our inability to post anything this weekend), but with enough time to give you the rest of the day to take advantage of a Galaxy S Blaze 4G Buy One, Get One offer going on now. The first handset will set you back $69.99, with the second Blaze 4G handset free out of the door. Sounds good right? It is good, especially with this offer applying to both 2 year new agreements and 2 year qualified upgrades. If you are looking to grab the Blaze 4G, and given the HSPA+ speeds it’s putting out, I wouldn’t blame you, head to Costco today! ← Mini Editorial: T-Mobile, Stop Attacking The iPhone On Slow Web Speeds? Not exactly free. In Illinois fro example they charge tax on full price (~ $35 per phone) Other retailers don’t do that here. So for both phones it is ~ $130 plus $50 membership fee. Don’t forget activation fees for 2 phones $70 which are also taxed by T mobile (~$10 extra). You add this all together and sometimes it is just better to buy on craigslist. That’s just your situation, not everyone’s. So, your whole intent is to pay no tax, pay less for your phone, data and freeload!!!. FYI, you can’t get a brand new phone on Craig’s List either. You are the kind of customer that clearly Tmobile needs to get lost. Tell me, what can go get for free in life? The $50 Costco membership can be avoid by just getting someone with a membership to go with you. I went down there with the intent to do the BOGO but I left because I dodn’t want to pay the tax on the entire $399 on both phones even though one is FREE. Its asinine to expect me to pay tax for something thats suppose to be FREE. I got a G2 instore before and didn’t have to pay tax on it. I also got a G2x online for free and also didn’t have to pay tax on that either. I can see paying tax for the entire price if there is a rebate involve but this is an instant saving. There are two things you can’t avoid in life, no matter how hard you try. Taxes and death. You are the first person I have ever heard complain that there wasn’t a mail-in rebate involved. Sorry Pauk the people have spoken and the people want Costco!! Wish we could bring bogo back to retail! This is why I get so angry working in retail stores….just had a lady ask about it and then drive down the street to Costco…. So is this deal already over again? The post seems to indicate that but the screenshot does not mention an expiration date for the deal. Prices are good until 3/27/2012. There’s a good chance it’ll be extended though since only Costco’s Top 100 producing t mobile locations have the Blaze until T-mobiles official launch this week. The remaining stores will get them on launch date. And for those not liking the fact of paying tax off retail price for the phones, FYI Costco does give free Activation fees on any and ALL new activations. Yes you do have to pay sales tax of retail pricing but with Costco’s free accessory bundle kit plus free activations you cant go wrong. Even on upgrades Costco doesn’t make you go through the hassle of doing mail in rebates. ALL INSTANT!! T mobile retail will have the phone for 100 each after mail in rebate once they get them in. Your choice. $130 out the door for 2 with tax, or $150 EACH out the door with no tax…. Which one sounds like a better deal now?? 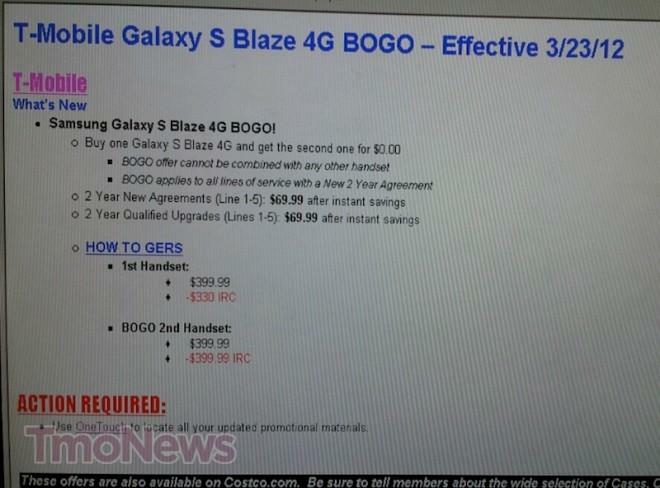 Weird, the Costco here in San Antonio denied that the offer was for the Blaze but claimed that instead it applies to the old Galaxy S.
Additionally they still don’t have the phones in stock which means it’s a moot point for me anyway unless the offer gets extended. Bummer.